Here is one popular noodle dish in Singapore that people love because of its simplicity. Char Kuey Teow is always a favorite by migrants here in Singapore. It wont take long when you order this and the idea is to eat this right away fresh from chef's hand. Life in Singapore is busy and you're always on the go so there wont be time to cook. The time you will spend for cooking should be a time devoted for rest and sleep. Why cook ? when hawker stalls are just in the corner to eat, to having here, to go, or to take away..lol. Just like Singapore, English is our second language back home. English accent proves to be difficult to grasp at first and more than a dozen times I felt frustrated because I can speak the language but I can not understand. Until one day, I realized that one must listen listen very well and understand the words the way locals did. In the end imitating Singapore accent has helped me to communicate well with the locals..yeah lah! and ordering food at the hawker stalls become easy. Char kway teow, literally "stir-fried ricecake strips", is a popular noodle dish in Malaysia, Singapore, Brunei and Indonesia. The dish is considered a national favourite in Malaysia and Singapore. It is made from flat rice noodles (Chinese: 河粉; pinyin: hé fěn; Cantonese Yale: hó fán) or kway teow (Chinese: 粿條; pinyin: guǒ tiáo; Cantonese Yale: gwó tìu) of approximately 1 cm or (in the north of Malaysia) about 0.5 cm in width, stir-fried over very high heat with light and dark soy sauce, chilli, a small quantity of belachan, whole prawns, deshelled blood cockles, bean sprouts and chopped Chinese chives. 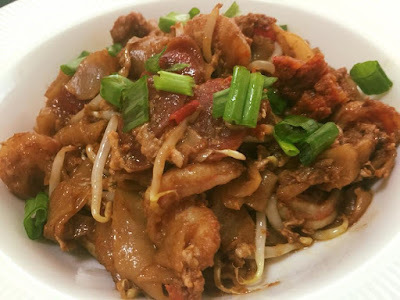 The dish is commonly stir-fried with egg, slices of Chinese sausage, fishcake, beansprouts, and less commonly with other ingredients.Char kway teow is traditionally stir-fried in pork fat, with crisp croutons of pork lard. In Penang, Char kway teow is commonly served on a piece of banana leaf on a plate, so as to enhance the aroma on the noodles. Mix all of the ingredients, blend them well, set aside. Heat up a wok or pan, add a tsp of oil' and stir fry the chili paste. Set aside. Add about 1/2 tbsp of chili paste, if you like spicy add more. Put the cockles . Stir fry and make sure the egg is cook. Add the chives, do quick stir and serve immediately. Note: You can cook by two batches. Remember its best to cook in a wok , with high fire..cook fast, move fast like a chinese ninja..lol! Yes, you can do it. This is simple and I'm sure most of the seasonings are in your kitchen. Don't worry about the cockles because you have the right not to include it. lol..In my case, I cooked the shrimp ahead and use it without the skin. I don't wanna be bothered taking out the skin while eating.. so, what do you think? oh come on...you should try this.